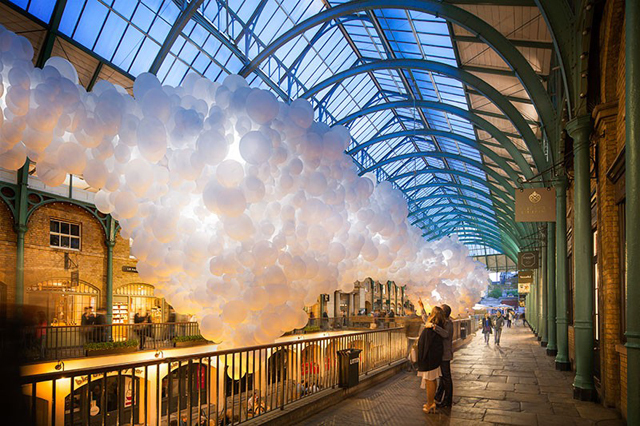 French artist Charles Pétillon will fill London’s Covent Garden with 100,000 giant white balloons for an installation opening on August 27. Known as Heartbeat, the work will fill the South Hall interior of the 19th century market building. The installation, which will look like a hovering cloud, is said to measure 177′ long and nearly 40′ wide. Alongside the installation, there will also be a popup gallery showcasing the artist’s other balloon-related artworks. As part of a series called Invasions, Pétillon has incongruously placed white balloons in an abandoned house, a basketball court, a forest, and a garage. Coventgardenlondonuk to learn more about Heartbeat.